For Those who Desire Flow, Freedom, Joy and Fulfillment by Connecting with your Inner Guidance System, Embodying your Feminine Power, and Manifesting Positive Change in the World. Vanessa Benlolo is a Professionally Certified Soul Parent | Spiritual Child™ Evolutionary Educator, Generational Healer™, Soul Speak™ Guide, Life and Executive Coach, and Spiritual Healer. Vanessa works in service of Mother Earth and supports the evolution of humanity. She guides women and men in releasing past conditioning and trauma in order to awaken your divine essence, so you can be connected, heart-centered beings and enjoy all that comes with it ~ ease, abundance, purpose, glow, joy, intimacy, creativity, truth, intuition, confidence, compassion, and love. a vibrant, expressive, radiant, magnetic, and flowing life. This path requires commitment to your soul - to being in relationship with your purpose and what is desiring expression and creation. It's not just about 'surviving,' its about creating from that place deep inside of you that has been suppressed by the 'demands' and 'shoulds' weighing on you. Your soul is aching to be expressed in all that you do. You may fear that you do not know who you are without what you currently see around you and at the same time, you know its not what you crave. I am here to take you on this journey - one with beautiful treasures along the way - to knowing and trusting yourself and creating from that intuitive place - your soul - where everything flows and miraculous synchronisities happen. Listen to your soul, stop self-sabotage, create healthy boundaries, and build regular practices that allow you to embody and manifest your soul's purpose with joy and ease. Support your soul's evolution guided by the spirit of your child to embrace love, heal what is desiring healing, and live from the depth of who you are. Learn to be a Soul Parent and support your child in who they are born to be. Relieve emotional, physical and/or mental pain and suffering by connecting with your ancestor and healing your family lineage of generational trauma. For the woman who desires to awaken her spiritual gifts, to become aware of the world of unseen energy, and to live from and embody this place of feminine power. 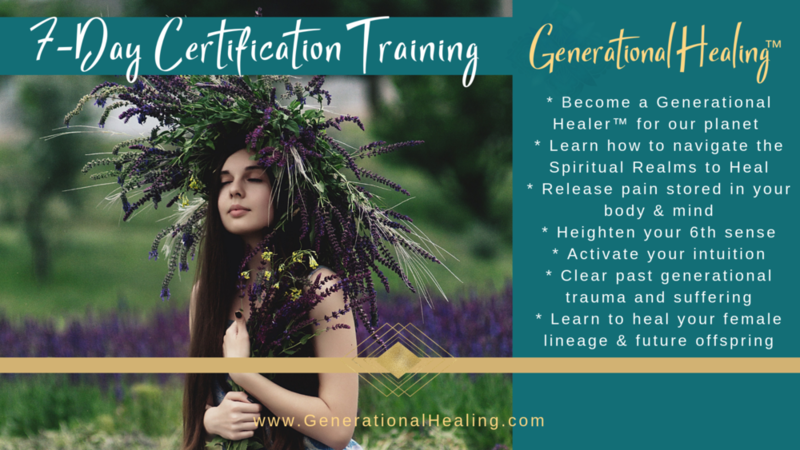 Serve humanity, awaken your healing abilities and heal yourself and your family from generational trauma passed on through your ancient bloodline by training to become a Certified Generational Healer™. Designed for the woman desiring to embody her divinity. A journey of sacred ceremony through 7 Ancient Feminine Awakenings to access and embrace your divine feminine essence. Meet with Vanessa and experience your soul lit up through her transformational events, playshops, and retreats! Would you like to receive soul-nourishing inspiration and resources from me? Thank you for subscribing to Light Up my Soul! Services offered in Collingwood, Toronto and Online.